Di-Modell is a German watch strap company that is sold at many different watch stores and sellers on the timezone.com forums for a couple of sellers. I purchased mine from cheapbas for $69.95US plus shipping in a 20mm lug width, and the buckle on this model is also 20mm. Looking into the specs for this watch strap, the 22mm and 24mm models also have a 20mm buckle, and therefore have a significantly larger amount of taper. 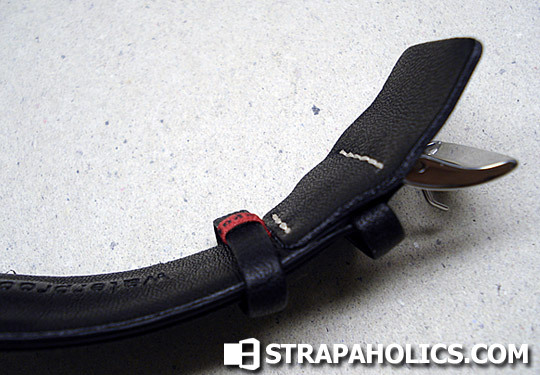 As you can see from the above photograph, the strap is made of several different layers of leather, with one that wraps over the top to hold the strap to the lug. The white contrast stitching gives the strap a decidedly sporty look, with all the complex layers and additional black stitching creating quite the myriad of textures and thicknesses. The craftsmanship is very good, and probably among the best I’ve seen in a factory strap. Di-Modell straps are sometimes handmade, though I’m not sure if this one is. The texture of the leather is pretty soft, with a deep grain like buffalo. 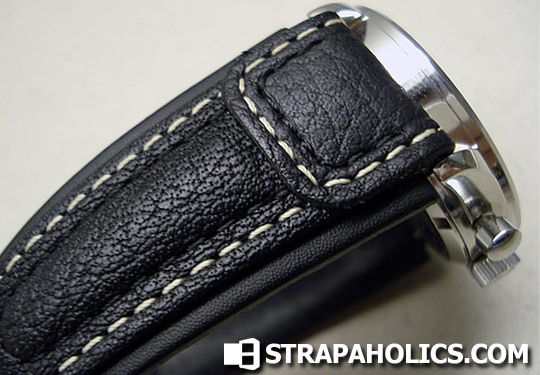 The leather on the backing of the strap is a bit smoother in texture, and is waterproof as is stated on the back. It actually feels almost rubber-like when I touch it, and feels extremely comfortable against the skin when its worn, even when my wrist gets sweaty. There is a flap that sticks out underneath the buckle, making it somewhat awkard to put on initially, but it becomes quite easy when you get used to it. Like many Di-Modell straps. The second floating keeper has a little stitched-in red holder to keep it from sliding too far, which I have seen on several Di-Modell straps before. The strap is medium stiffness, and bends relatively easily, but does not torque easily. 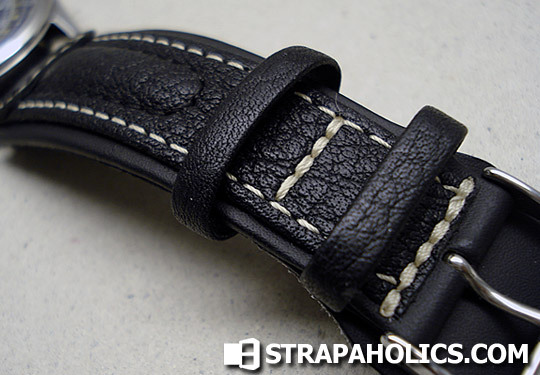 There is an extra padded section in the middle of the strap, which gives the strap a very unique look. This is supposedly one of Di-Modell’s most popular straps on Timezone sales according to the sellers. I can see why, because it looks VERY good on the Eterna Cambridge watch that it is modelled on. I would like to pick up a 22mm model to use on some of my pilots. This strap is an excellent choice for sport pilot-style watches, and adds a waterproofness to it which is a fantastic feature. 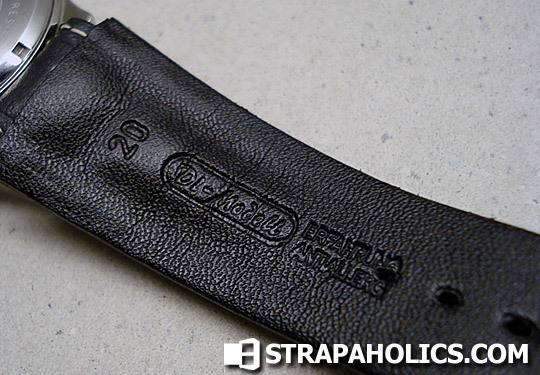 The strap is quality made and doesn’t show stress marks when used very easily. Highly recommended. This entry was posted in Watch Strap Reviews and tagged Di-Modell. Bookmark the permalink. Post a comment or leave a trackback: Trackback URL. I’ve owned this as well and it was a nice change of pace on my BP 5004. Very Nice! I’ve love to see a pic of the Chronissimo on a BP! Are you on the forum? Not yet. I sold the strap a month or so ago but I’ll try and dig up some pics. I have a DM Chronissimo and love it, but inspite of ordering their longest length it is still a little short for my wrist. Are you aware whether they are able to fill orders for custom lengths? I believe that Di-Modell does do some extra length straps, but not sure if they do for this one.